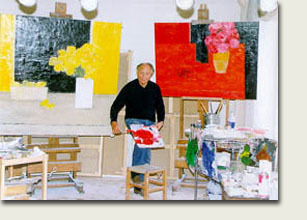 Bernard Cathelin was born on May 20th 1919 in Paris. Throughout his life, he has maintained a deep-rooted love for his country and especially for the Drôme, from where his mother came. The 1950’s marked the beginnings of the artist’s international success and recognition and major critical acclaim. The Musée de Valence organised a retrospective of his work in the summer of 1997.In the year 2000, the Shanghai Art Museum will be inaugurated with a retrospective exhibition of the works of Bernard Cathelin. 1919 Bernard Cathelin born on May 20th 1919 in Paris. Son of Paul Cathelin and Madeleine Terrail. Classical studies in the lycées Carnot and Janson de Sailly in Paris and the lycée Emile Loubet in Valence. 1945 Student for the next three years in the Ecole Nationale Supérieure des Arts Décoratifs (French National School for further studies in the Decorative Arts) and in the studio of Maurice Brianchon. 1947 Teacher until 1953 in the Preparatory Studio of the Ecole Nationale Supérieure des Arts Décoratifs. 1948 French delegate to the first congress of the International Students Union in Prague. Trips to Czechoslovakia, Hungary, Jugoslavia, Bulgaria and Italy. 1950 Awarded the Blumenthal Prize. 1953 Awarded the Emily Loewe Prize. Exhibition at the Galerie Saint-Placide, Paris. 1958 Awarded the Othon Friesz Prize. Exhibit at the Galerie de Montmorency, Paris. Bernard Cathelin goes to New York for his one-man show at the David B Findlay Gallery. The New York Herald Tribune features him on the cover of its Sunday supplement. 1960 Exhibition at the David B Findlay Gallery, New York. 1961 Exhibition at the Galerie Marcel Guiot, Paris. 1962 Exhibition at the David B Findlay Gallery, New York. Trip to Mexico, Peru and Brazil. 1964 Exhibition at the Galerie Marcel Guiot, Paris. 1966 Exhibition at the David B Findlay Gallery, New York. Trips to Mexico and Guatemala. 1967 Trips to USSR (Transsiberian) and Japan. Exhibition at the Yoshii Gallery, Tokyo. Trip to Cambodia, Ceylon and India. 1968 Exhibition at the David B Findlay Gallery, New York. Trips to Mexico, Nicaragua and Brazil. 1969 Trip to the Netherlands. 1971 Exhibition at the Galerie de Paris, Paris. 1973 World Tour: New York (exhibition at the David B Findlay Gallery), San Francisco, Tahiti, Tokyo (exhibition at the Yoshii Gallery), Hong Kong, Burma, Nepal, India, Moscow (Zagorsk). In July: creation of his first tapestry, "The Mexican Market" by Atelier 3, Paris. 1975 Exhibition at the Galerie de Paris, Paris (paintings). Exhibition at the Galerie Marcel Guiot, Paris (tapestries and lithographs). Exhibition at the Yoshii Gallery, Paris (water-colours). 1976 Trips to the United States (exhibition at the David B Findlay Gallery, New York), Mexico, Colombia and Ecuador. Madeleine Cathelin-Terrail donation: Bernard Cathelin gives 50 lithographs to the Valence Museum in memory of his mother. 1977 Städtische Galerie in der Unteren Schranne, Biberach an der Riss, West Germany (lithographs). 1978 Trip to Japan (exhibition at the Yoshii Gallery, Tokyo). Trip to Belgium (exhibition at the BP Gallery, Antwerp). Trip to the United States (exhibition at the David B Findlay Gallery, New York, a retrospective to mark his twenty years of collaboration with the gallery). Trip to Saint-Martin in the Leeward Islands, Caribbean. Exhibition at the Galerie Marcel Guiot, Paris (lithographs). 1979 Exhibition at the Galerie Marcel Guiot, Paris (tapestries). 1980 Trip to New York. Exhibition at the David B Findlay Gallery, New York. Exhibition in the Chapelle du Grand Couvent, Cavaillon, France (tapestries). Exhibition at the Galerie François Ditesheim, Neuchâtel, Switzerland. Exhibition in the Château de Vascueil, Normandy (tapestries). 1982 Stay on the Island of Kyushu in Japan to prepare the Haïkaï album. Exhibition at the BP Gallery in Antwerp, Belgium. 1983 Exhibition at the Yoshii Gallery, Paris. Presentation of the book featuring the ten Haïkaï, EF Mourlot Editions. Exhibition at the Munson Gallery, Santa Fe (paintings and tapestries). Trip to Antigua, West Indies. Exhibition at the Galerie Pierre Hautot, Paris (tapestries and oils on paper). Exhibition to the Pierre Gianadda Foundation, Martigny, Switzerland (paintings, lithographs and tapestries). Exhibition at the Danis Stinson Gallery-Artfrance, Palm Springs California (tapestries). Exhibition at the BP Gallery, Antwerp and in Brussels, Belgium. Exhibition at the Mazarine Gallery, Montreal, Canada (paintings, tapestries and lithographs). 1987 In June: major exhibition in the Château de Chenonceau, France (paintings, lithographs and tapestries). In October: exhibition at Artfrance, Paris (paintings). In November: exhibition at the Yoshii Gallery, Tokyo, in celebration of his 20 years of collaboration with the gallery (paintings). Different exhibitions in Osaka, Kobe and Tokyo (paintings). Exhibition at Artfrance, Paris (lithographs). Exhibition at Art London International Art Fair in London (stand Artfrance). Exhibition at the Buschlen-Mowatt Gallery, Vancouver, Canada (paintings, tapestries and lithographs). Exhibition at the Gage Gallery at Irving, Los Angeles. Exhibition at the Hermann Gallery, Essen, West Germany (paintings and lithographs). 1990 In March: exhibition at Art London (paintings), presented by Artfrance. Exhibiton at Art Expo, New York. Exhibition at La Bouquinerie de l'institut in Paris. Lauching of the screen "White Roses for Paris". In November: exhibition at the Yoshii Gallery, Tokyo (paintings). Exhibition at the Printemps Ginza Gallery in Tokyo (lithographs and tapestries). Exhibition at the Kintetsu Gallery in Osaka (lithographs et tapestries). Throughout this period, Cathelin undertook many far-ranging trips leading though Mexico, Spain, Peru, India, Nepal, Italy, Colombia, Russia... He returned to stay and work in those countries which stimulated his urge to paint: Latin America and specially Mexico, Japan, to where he returns regulary for his exhibitions, Tuscany and Venice in Italy and more recently Spain. 1991 In May: exhibition at Art Expo, Chicago. In June: Poster "Hommage to the Drôme" presented to the local authorities. In October: exhibiton to Artfrance, Paris (oil on paper). In November: exhibition to the Printemps Ginza Gallery in Tokyo (tapestries and lithographs). 1992 In March: edition of 8 lithographs to decorate the Shin Yokohama Prince Hotel with trip to Japan for the opening. Exhibition at the Elysium Gallery in New York (tapestries and lithographs). In June: Awarded the "Golden 26" by the French département of the Drôme. In July: Elected painter for the Aix-en-Provence Summer Art Festival (official poster). Exhibiton at the Galerie de la Prévôté in Aix-en-Provence (paintings and lithographs).